I’m sure you’ve heard the above saying and yes, it’s me. How? Well let me tell you. I often have clients who say, “Your house must be perfect” after we go through a home inspection and I give them advice on remedies for certain problems. If they only knew. Time to fess up! I don’t let people in certain areas of my house because I don’t want them to see the dirty truth. It’s not about having everything perfect as much as knowing what you can live with and believe you me, my tolerance is high! 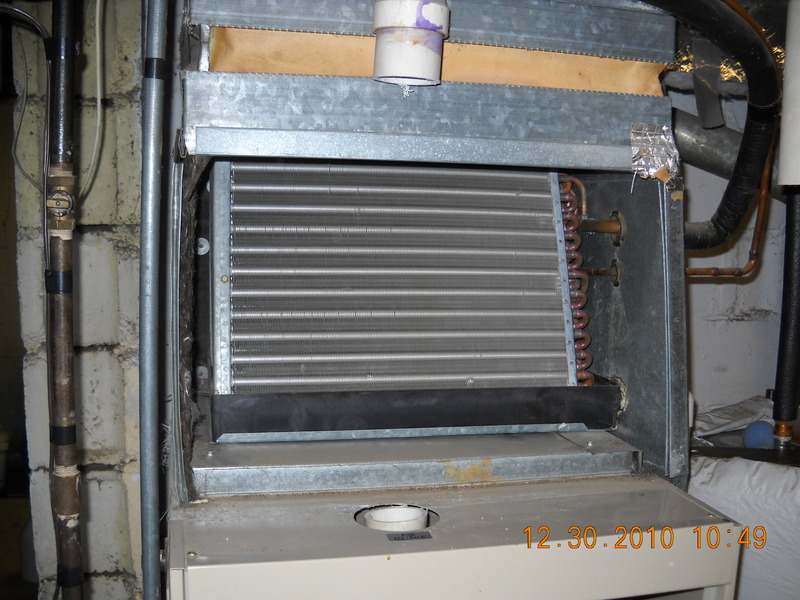 😉 Yesterday I did finally take care of something that has been bothering me for a year or so…….my furnace. 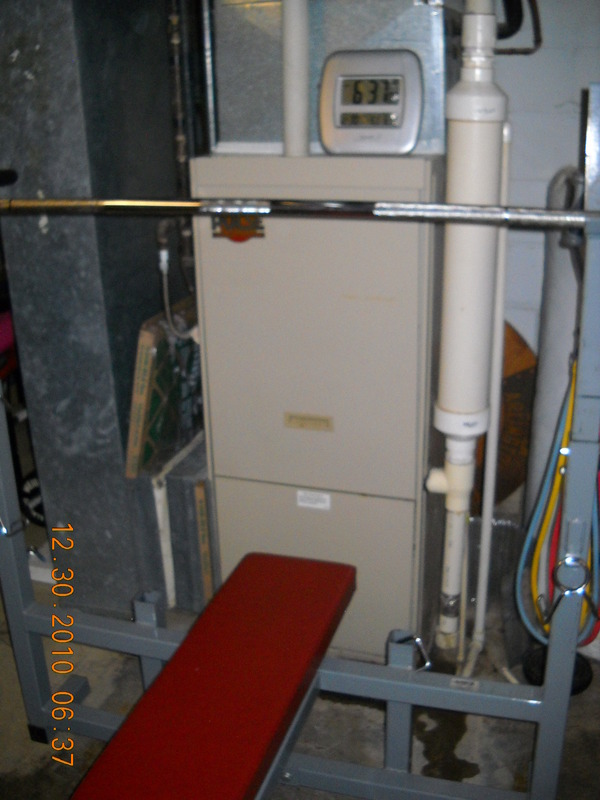 I had a 1984 Lennox Pulse furnace that was there when we bought the house. The Pulse furnace is very interesting. It was a higher efficiency furnace which was ahead of its time. 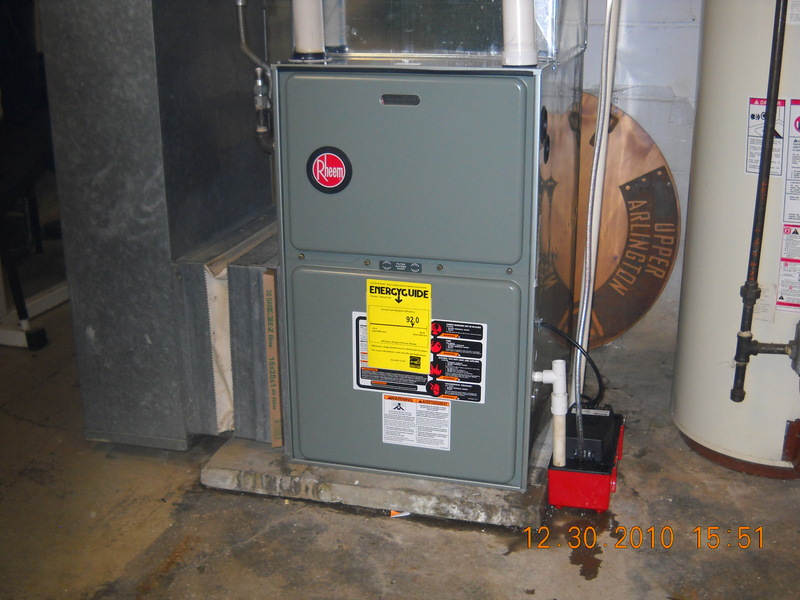 A condensing furnace which means that it gets some of the residual heat from the combustion gasses which normally vent up through the roof area/chimney and vents them through PVC pipes out the side of the house. If you have a furnace that vents through PVC pipe in this such arrangement, as a rule of thumb you can assume that your furnace is probably at least 90% efficient. Good to know, huh? I’m full of interesting to me only knowledge. Anywho, the Lennox was failing, I saw the signs, I knew what was coming , blah, blah, blah! The main thing is, who like to drop over a couple large ones in one day. Man, for that kinda loot I at least want a meal cooked by Tom Colicchio and a custom beer brewed by Great Lakes Brewery. But trying to be the responsible one (For once as Jul would tell you. I still don’t see why I shouldn’t be able to buy a better metal detector?! Think of the jewelry I could find her. It would practically pay for itself!) I bit the bullet and scheduled the appointment. It might be different if I knew that the furnace would fail during a nice spring or fall day but generally I’m not using the furnace at that time. Following this logic, it would fail during a brutally cold winter day and I would have to move into my in-laws while the HVAC person got it replaced in a couple days. If that thought doesn’t make you shudder, than….well…..you know what I mean. Also, the furnace was beyond repair. The Lennox Pulse is a difficult one to repair as well as find someone who even wants to work on one. The haven’t been made for awhile and techs just don’t get much practice working on them. On this note I documented the event and will now share the journey with you, dear reader. Also, time for a shameless plug. My dear wife, Julie, and I have known Ron Williams and his sidekick Antony (I write it this way ’cause they are from the Boston area originally and that is the way it sounds) for a good bit of time. The company is Columbus Home Services at 614-607-9485 and they are great. Personable, presentable, knowledgeable, all the -ables really. Let me throw in reasonable as well for price. They aren’t the cheapest and not the most expensive. Here is my take on price and there are two points. First as the sign in the shop where Jul and I go to get tattoo’s says “Good tattoo’s aren’t cheap and cheap tattoo’s aren’t good”. Just fill in “work” for “tattoo’s” and you get my point. You will pay more in either add-ons that they don’t tell you about OR getting cheap work fixed. The last thing about price is this. I always tell my clients to get a few estimates for work to be done and throw out the cheapest and the most expensive. I generally stand by that. Now on to the goods. Following are pics my journey. I also bribed them with coffee and pizza and made them put up with me watching the whole day to continue my own education in HVAC for home inspections. Click on pics to enlarge if you so desire. My 1984 Lennox Pulse furnace. The fat pipe to the right is a muffler type device for venting because the Pulse was so loud it helped cut down on the noise! 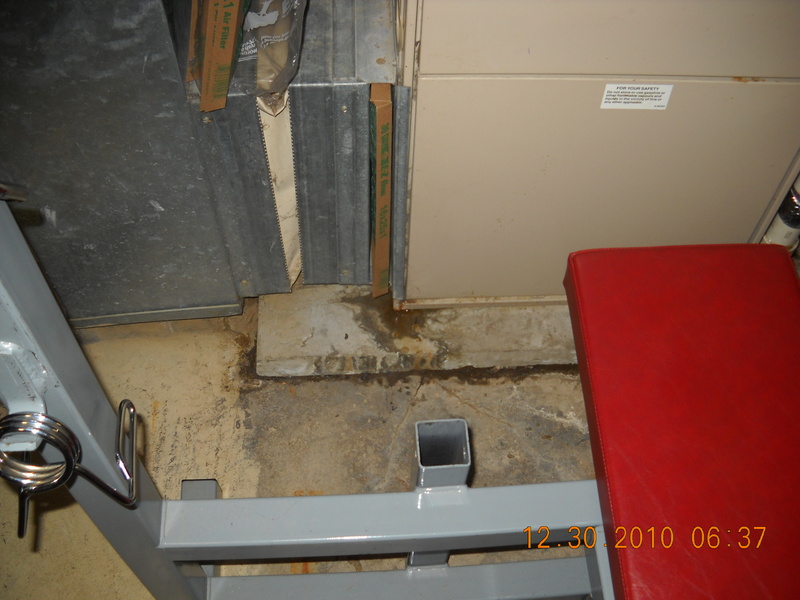 Condensate water leaking out of the bottom left of the cabinet. FYI, not normal and not good. 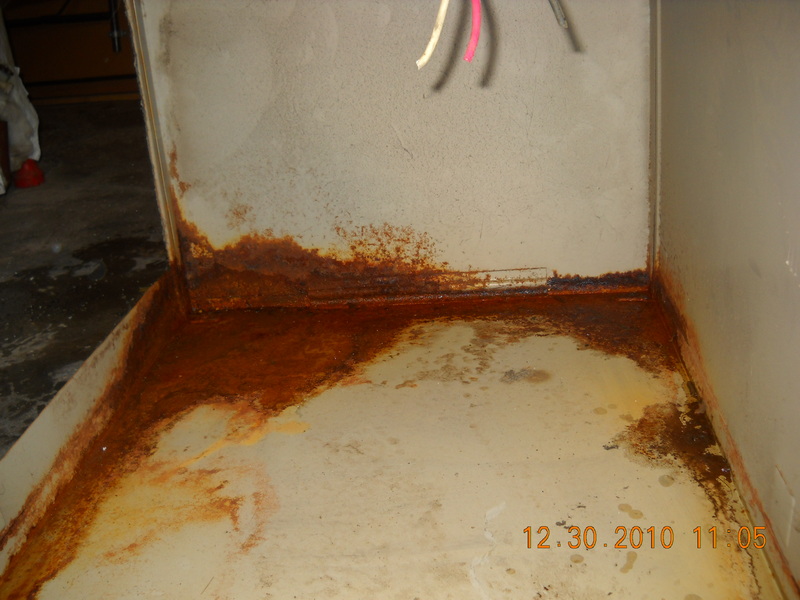 The inside of the cabinet rusting out. Also, all the electronics that keep things running are below this area! We all know electronics and water are a good mix. The bottom of the cabinet behind the electronics which have been removed by Ron. Cue sounds of angels! Turn on blinding bright light from behind! This is the new furnace, a 90% Rheem. When I commented that I liked the color, I was informed by Antony to not say that around too many people! Hmmmm, food for thought. 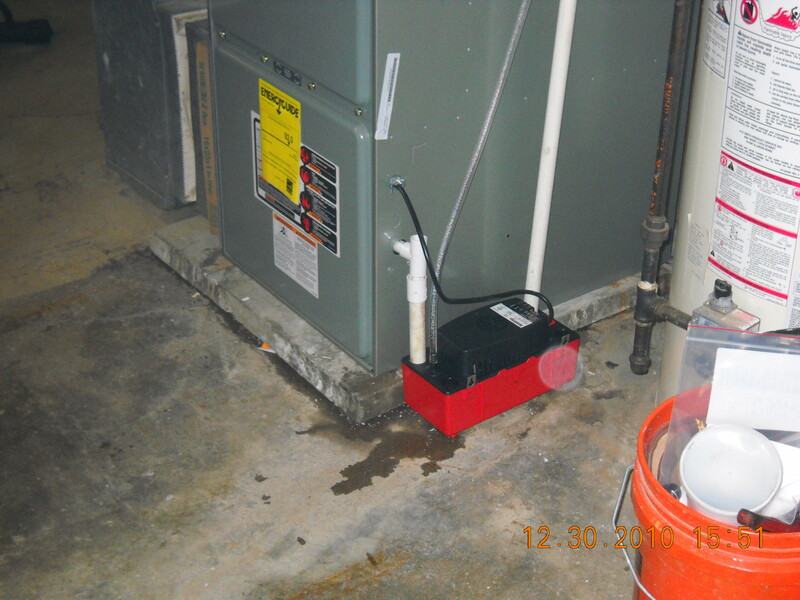 The red box on the right is a condensate pump. It will pump the moisture up and over to the floor drain instead of having pipes run along the floor. I requested that so I wouldn't trip over PVC pipes on the floor while I was getting my workout on. I love having this! That’s all folks. Thanks for coming along on my HVAC journey. 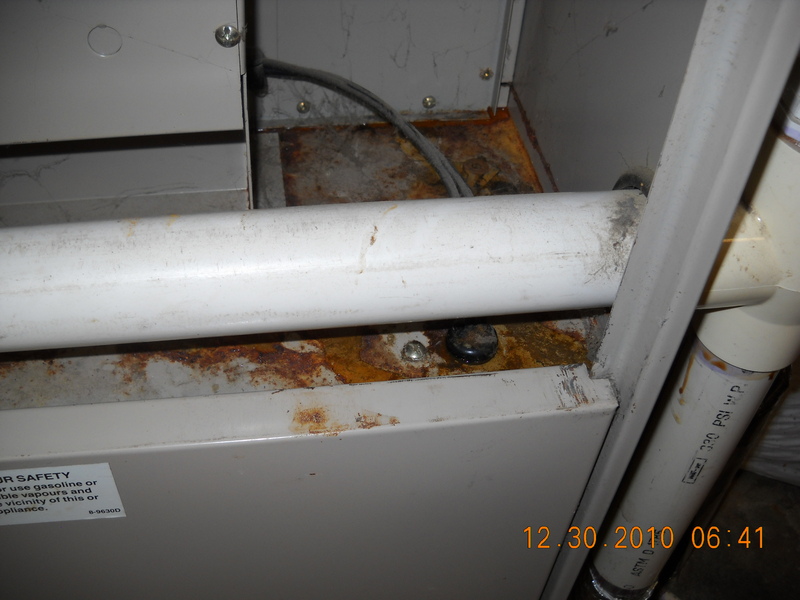 If you have any HVAC questions or anything I can try to help you diagnose, drop me a line.